Corned beef is a meat dish well known today for its place in delicatessens and Irish restaurants nationwide. Originally developed as a way to preserve meat for extended storage, corned beef's attractive flavor and texture have granted the high-protein dish a popularity beyond its utilitarian beginnings. Corned beef's enjoyable taste, however, generally comes with a health penalty, as typical cuts include high amounts of fat, cholesterol and sodium. Corned beef was originally produced as a form of beef that could be preserved for long periods with a low risk of spoilage. Before refrigeration technology was invented, Anglo-Saxons in old Britain found that liberally coating cuts of beef with salt "kernels" enabled them to hold the meat in storage until needed. Corned beef today is prepared using liquid salty brines and spices to "pickle" the meat. The dish's particular flavor and texture have granted it an enduring popularity. Data from the U.S. Department of Agriculture documents that a cooked standard serving of corned beef, weighing 3 oz., contains 16 g of total fat, 5 g of saturated fat, and over 80 mg of cholesterol. The meat also contains over 960 mg of sodium and 15 g of protein. Corned beef is generally made from the fattier brisket areas, so the fat and cholesterol levels tend toward the high side of commonly available beef cuts. The amount of cholesterol in an average corned beef serving equals almost 30 percent of the American Heart Association's recommended daily maximum 300-mg cholesterol intake for people without health issues. Corned beef's 16 g of fat and 5 g of saturated fat add up to almost 25 percent and 35 percent, respectively, of AHA guidelines for total daily consumption of fats for healthy Americans. People with cardiac health issues are advised to substantially lower their fat intake, and keep their cholesterol consumption below a maximum of 200 daily mg. Sodium is often targeted as a blood pressure and heart health culprit, and corned beef's inherently salty preparation and flavor makes it a major sodium source. A single corned beef serving holds almost 40 percent of the recommended daily total sodium consumption for normal individuals. If you're on a low-sodium or sodium-restricted diet, the 960 mg of sodium in a single corned beef serving can bust a daily sodium limit wide open. During production, most commercial corned beef is treated with sodium nitrite, a common preservative that acts to retard bacterial growth, maintain an appealing red color and add a notable flavor. Some researchers believe that nitrosamines, which can form when nitrites are cooked at high temperatures, may be carcinogenic to humans in adequate concentrations. U.S. law limits the amount of nitrites that may be added to meat, and requires that all producers who use nitrites add a supplemental chemical (often vitamin C) that counters nitrosamine formation during cooking and digestion. While corned beef can't generally be considered a healthy dish, there are steps that can help lower the levels of fat and sodium in a serving. Start by asking for an extra-lean corned beef cut. If ordering from a butcher, the top layer of fat should be fully trimmed off the brisket. When preparing, cut away visible fat both before and after cooking. Steam-cooking helps melt fat off the meat. Return beef slices to the steamer to help remove some interior fat. Boiling the sliced meat in fresh water can also help lower sodium content. 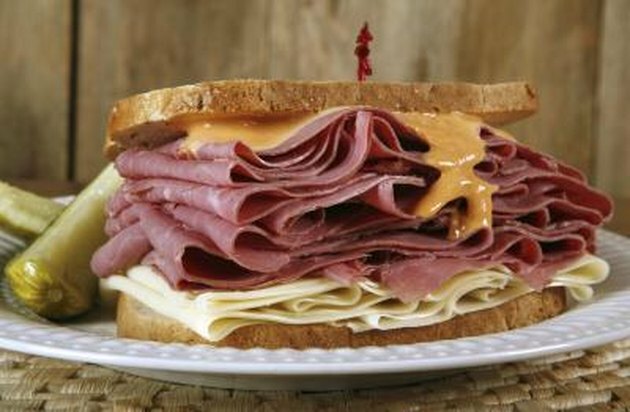 Remember that cheese and dressings can raise the cholesterol, fat and sodium content of a corned beef dish. Are Pregnant Women Allowed to Eat Cooked Hot Dogs?